COOK-EZEE: ഗോതമ്പ് പായസം/Gothambu Payasam/Broken Wheat Payasam and Happy Vishu Wishes!!! എന്നുമെന്നും ഐശ്വര്യവും സമ്പദ് സമൃദ്ധിയും നിറഞ്ഞതാവട്ടെ. എല്ലാവർക്കും വിഷു ആശംസകൾ!!!! 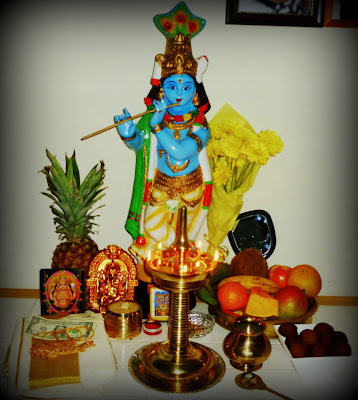 Wishing everyone a Very Happy Vishu!!!! Wash broken wheat two-three times. Pressure cook them by adding four cups of water for two whistles. Open the cooker after the pressure leaves, drain off the water. Pour another two-three cups of water and drain again to remove excess starch. Boil 1½ cup of water, add Jaggery cubes and stir till they melt. Filter the jaggery syrup to remove any impurities. Pour this jaggery syrup to the cooked broken wheat and put on this stove. Let it boil on medium heat for five-seven minutes, stirring occasionally. Add in thin coconut milk and let it boil again for ten-twelve minutes or till jaggery combine well with broken wheat. Make sure to stir the payasam in between not to stick onto the bottom of the pan/cooker. Add in the thick coconut milk, let it boil again for another two-five minutes. If the payasam seems very thick, add some boiled water or little bit more thin coconut milk. Add cardamom pods and sugar to in the smallest mixer/grinder and grind/powder them. Add it to the payasam and stir well to mix. Take them off the stove. Heat a small pan, pour ghee, saute the cashews till they turn the color, add to payasam. Add raisins to same ghee and saute till they pop up and add to the payasam. Add Coconut pieces to the same ghee, add more ghee if needed and saute well till they turn light brown, pour over the payasam and stir well to mix. The very delicious gothambu payasam is ready to serve. Enjoy with your family and friends!!! 1. Cooking with excess water and straining reduces the starch smell and reduces sticking to each other. happy vishu to you too..and the payasam luks very inviting. Happy Vishu to you. yummy kheer. Mouthwatering here, wat a terrific and super tempting payasam..Happy vishu wishes to you. Gothambu Payasam looks delicious Prathiba, Happy vishu to you and family.